This Stratford Festival smash hit brings to life the world of legendary theatre genius John Hirsch. Orphaned by the Holocaust at age 13, Hungarian refugee Hirsch lands in Canada and finds a new home in the world of theatre, where his fierce talent, stormy temperament and uncompromising drive propel him to great heights but also challenge his existence. ‘A brilliant triumph’ – Ottawa Citizen. 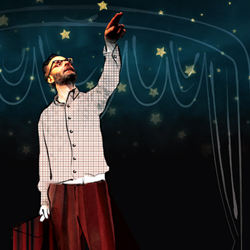 ‘Reorients our perception of where the magic really comes from’ – New York Times. A Theaturtle Production. Created and conceived by Alon Nashman and Paul Thompson. Directed by Paul Thompson. Presented by the Firehall Arts Centre, Chutzpah! Festival & Touchstone Theatre. Produced with the support of Richard Jordan Productions, Liz Bradley Arts Enterprises, in association with the Pleasance.